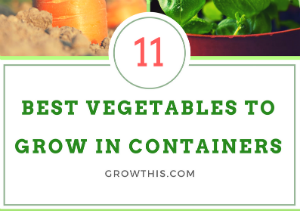 11 Best Vegetables To Grow In Containers | Small Spaces Can Have Big Results! Did we mention fruit? Tomatoes are perfect for container growing. Just about any indeterminate tomato plant will work great. Try cherry tomatoes in a 5-gallon pot. Just remember that the smaller the container, the fewer tomatoes your plant will yield. Water regularly and they should do great. You’ll need to use stakes to support the vines once they take off, but your tomatoes will thrive as a result. Eggplants have a compact nature that makes them ideal for container growing. One plant per 5-gallon pot is usually ideal. Keep the soil moist and give them plenty of light. You may need to have a small stake handy for support as the plant grows. All varieties of lettuce and leafy greens, including arugula and spinach, are great for container growing. Simply sprinkle your seeds and keep the soil moist and your salads will thank you. Best of all, they don’t take long to harvest. 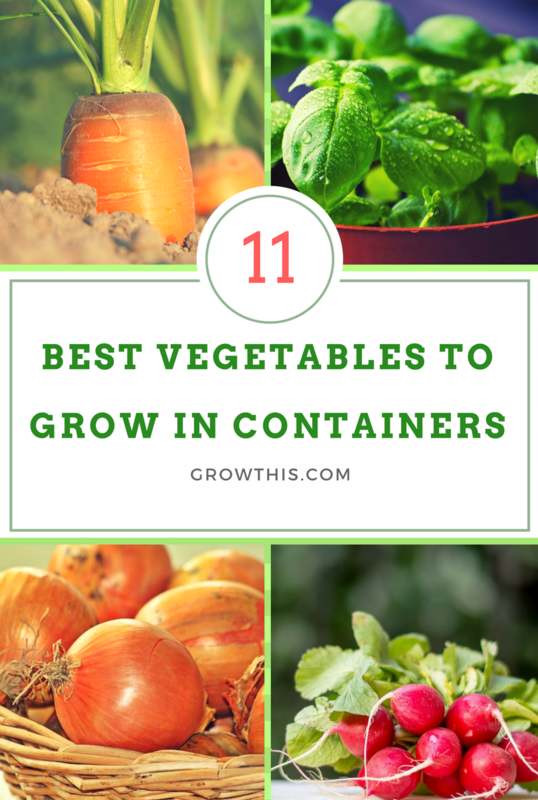 You may be surprised to learn that carrots are the perfect vegetables to grow in containers. For shorter varieties you can get away with a 6 to 8 inch pot. Longer varieties will need more space. Be sure to thin plants as they come in, saving about 20 per 12″ pot. Any type of beet will grow great in a pot. Most varieties will need at least 12 inches of soil depth. Try not to crowd them – 6 plants per 12″ container. Pick them as baby beets and you can fit even more. Radishes are one of the easiest vegetables to grow in containers. Scatter some seeds around the pot and water regularly keeping the soil moist. After about a month your radishes should be ready for harvest. A 12 inch, 5 gallon pot should be sufficient. Choose dwarf pea varieties like green arrow and English peas for container growing. A 12” pot should be able to handle 6 plants. To grow potatoes in a container, you’ll need a 5-gallon pot. Plant 3 potato eyes about 2 to 3 inches from the bottom of the pot in about 10 inches of potting soil. Water and as they grow, cover the stems with more soil leaving only the very tops exposed. Once the pot is full, sit back and in a couple of months you’ll have spuds ready for harvest. Green onion sets are best for container growing. Plant them 2 to 3 inches deep in a 5-gallon growing pot. Squash need at least a 5-gallon pot to grow well. Start with three plants per pot and thin to the healthiest one. Herbs grow excellent in containers. Try basil, parsley or rosemary but just about anything you’d like to liven your culinary dishes should thrive well. Grow them indoors in a sunny window.